It’s fun to see other blogs and brands feature our home in articles where you can “get the look” – like Copy Cat Chic’s take on my living room or One Kings Lane’s tips to recreate my bedroom. I’ve wanted to do a series with the exact sources for everything in our home for a while, so when One Kings Lane shared this photo of my desk yesterday, I thought I’d start with one of my favorite places in our apartment – my home office! Contrary to the common advice that one should make their bedroom a sacred space for sleeping, we placed my work desk in the bay window of our bedroom to take advantage of the natural light and a lovely view of the garden out back. I’d much rather look at the sky than a wall while I’m working! To keep the bedroom serene I try to make sure the desk doesn’t overflow with papers and used a calming color scheme of pale blues and greens. Foremost we should talk about the desk. It’s one of our favorite finds because we got it for only $180 on craigslist. In small apartments, it’s necessary for pieces to pull double duty and there are 2 hidden draw leaves that pull out to transform it into a 10′ dining table – perfect for when we host large dinner parties. (You can see what that looks like here and here.) To keep the look from becoming too dark and heavy I paired it with this modern acrylic slither chair. The slither chair is surprisingly comfortable, and doesn’t take up much visual space. Be sure to put a rug down with this chair though, as the bottom of the chair is prone to scratching wood floors. The rug pictured is the coastal jute rug from Home Decorator’s Collection. To find a similar table I’d search for “jacobean table” or “draw leaf table” on craigslist. Our piece needs to be refinished so if you find one in better condition paying up to $400 would still be a great deal. 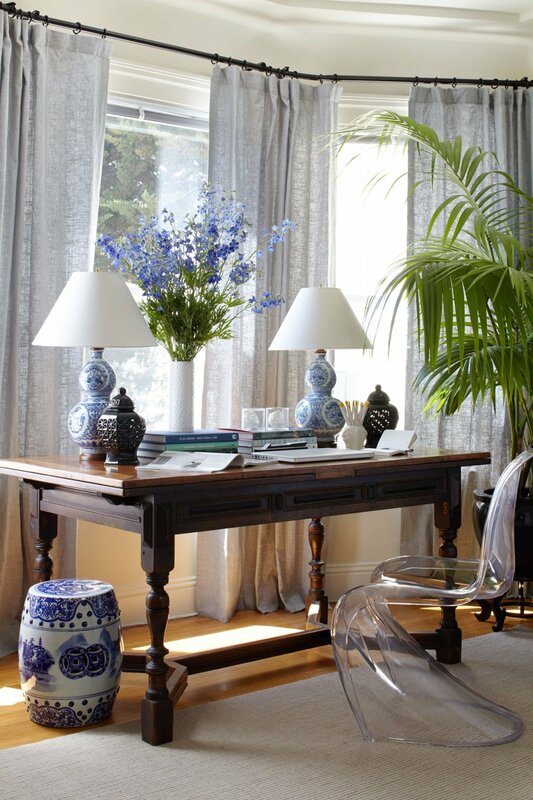 I have a weakness for all things blue and white and the chinoiserie lamps were a wedding gift from my parents. I tried to track down the exact lamp – which is by Ralph Lauren – and could only find one on eBay. I picked up the ceramic garden stool in NYC’s chinatown but they’ve become very popular in the last couple of years and now online retailers have many designs to choose from. Garden stools are so versatile and I have 6 tucked around the house. They come in handy as side tables, step stools or extra seating. It took me a long time to put up drapes in our house because we’re renters and I thought it would be too much of a hassle to install. Then I discovered Ikea has an easy and – as expected – affordable bay window rod system and I was thrilled! Adding these linen drapes to our bedroom gives us a little more privacy and the strong vertical lines make our ceiling feel even taller. They made the room feel so much more “finished” I’m surprised it took me so long to put them up! I love having a large house plant in our bay window as an extension of the garden outside, and I can’t overstate the importance of having plants as a part of your decor! I remember thinking the air felt so much cleaner after bringing our areca palm tree home, and who doesn’t feel happier having fresh flowers on their desk? I potted the palm in this black planter and placed it on this stand for some additional height so the fronds would arch nicely over the table. No workspace is complete without a few decorative odds and ends that make you smile. For me I love this vintage deco style vase with two horse heads that I use as a pencil holder, a beautiful set of dominos David gave me for Christmas last year, and 3D printed heads (one of me and one of David) that we made at the Makerbot Studio in SoHo on an early date. (#Nerds). I group my massive collection of coffee table books by color and use them on almost every surface to vary the height of the tablescape. For my desk I picked tomes in blues and greens. You can see the 6 I use on my desk here. To tour more of my home you can see Part 2 here and Part 3 here. What do you keep on your desk that inspires you?